Many more surprises have occurred for this week's update. Our peculiar curving walls to the north appear to contain a different deposit. Russell Moore has been patiently excavating this small area in hopes of understanding its context better. Numerous small finds suggest lengthy use or occupation. Northwest corner of Trench PC 19. 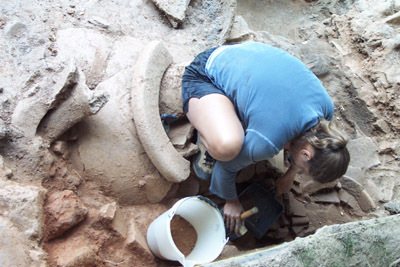 My assistant and second-year veteran, Caitlin Vacanti, is delicately uncovering the intact remnants of at least two large storage vessels. 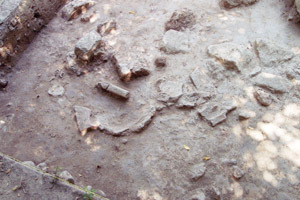 Until the latter part of last season, this particular area had been sealed in a dense layer of decaying brick that probably formed part of the building's large walls. 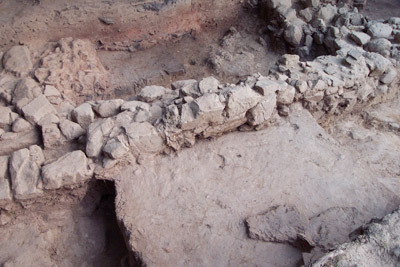 Detail of Trenches PC 19 and 22 with pithos rim exposed during Week 3. Aaron Bartels and Candace Grove are also diligently excavating a specific area west of the curvilinear wall in order to identify its potential use and construction. 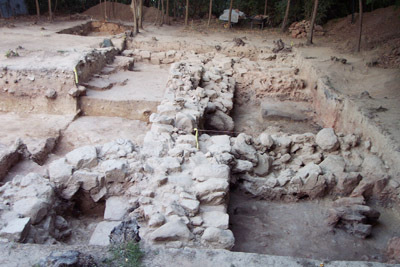 At present, they have uncovered a layer of what is probably building debris including numerous terracotta roof tiles, bricks, and a variety of wall stones. Overall, the sequence of unit 19 and 22 is becoming clearer as work progresses. 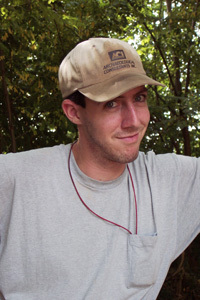 The remaining second-half of the field season should prove even more interesting. 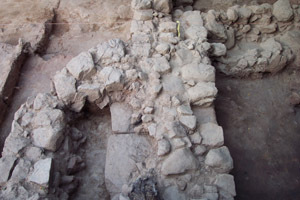 Large block shown left of the wall in Trench PC 19. The ever contemplative Justin Winkler. 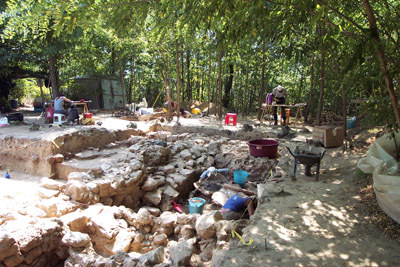 Excavation this week continues to reveal important information regarding the southwest site area. 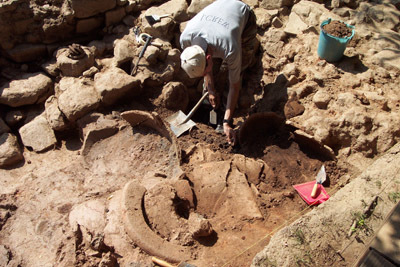 Russell Moore and Caitlin Vacanti continue to uncover sizable pieces of articulated vessel fragments. Each piece appears to form a very large pot probably used for storing foodstuffs. Numerous deposits of seeds have also been encountered and collected for further analysis. 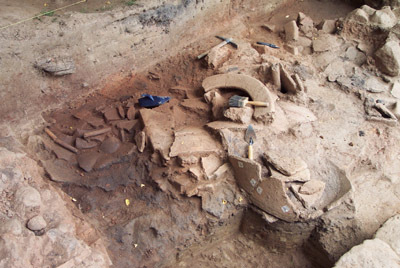 excavating the area of the large storage vessel in PC 19 and 22. The structure argued for last season seems much more questionable this year. After piecing together this year's new information with what we now know from past seasons, it may be likely that the building is really a series of rooms arranged in a rectangular plan flanking the perimeter of an open inner area. 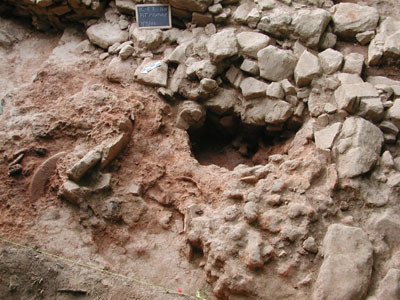 When evaluating the site's various contexts, Poggio Colla as a whole appears largely devoted to production, storage, and possibly redistribution. 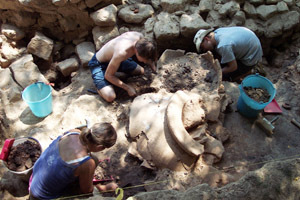 Little is known about Etruscan socioeconomic organization at the regional scale, thus the Mugello provides an excellent opportunity to meaningfully reconstruct these cultural phenomena. Unfortunately, this week has not revealed any new discoveries. Intermittent thundershowers have delayed our progress significantly. Excavation has been suspended somewhat until the weather conditions clear and allow us to proceed as planned. Be sure to stay tuned for new updates during weeks 6 and 7. View of Trenches PC 19 and 22 partially covered for rain protection. Russell Moore, Candace Grove, and Aaron Bartels near the end of Week 6. Since the rains have subsided work has been progressing steadily. This year's field season is coming to a close and we are continuing to increase our knowledge significantly. 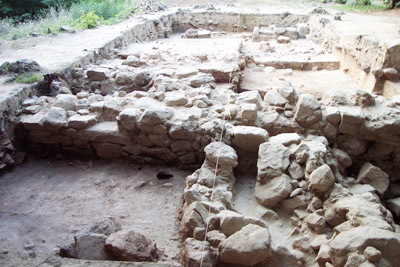 It now appears clear that the west perimeter of the main building is comprised of at least two semi-subterranean rooms. Each room contains a number of well-preserved pottery vessels of varying size and shape containing numerous kinds of seeds and perhaps other organic remains. 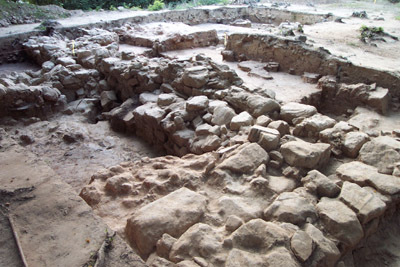 Did this area simply function as storage for an extensive settlement complex, or was it an area designed to house goods meant to support a religious class within a temple complex? At present, the evidence could be interpreted either way. Once conservation is able to reconstruct many of the larger storage vessels, we will be able to more fully reconstruct the overall context of both areas. The excavated zone to the east appears higher in elevation and might indicate that the main structure enclosed an open plaza of some sort. In any case, the students are diligent and continue to accomplish much during these last few days. Accordingly, the final days of the season are often the most productive which always leaves a great deal to ponder until next summer. Caitlin Vacanti, Justin Winkler, and Candace Grove push to complete the season's work. 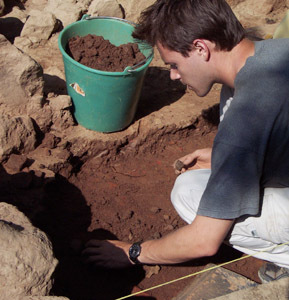 Justin Winkler carefully excavates the large pithoi and their contents from Trench PC 22. Aaron Bartels working in Trench PC 19 during Week 6. View of Trenches PC 19 and 22 from the northwest corner. This season involved a great deal of work and determination. None of this would have been possible without the participation and enthusiasm of many students. 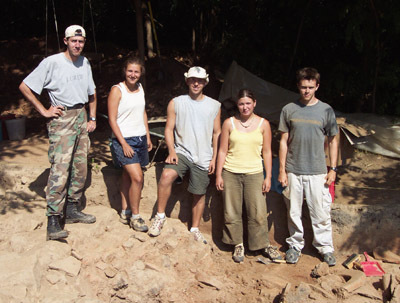 In particular, I wish to convey my thanks and appreciation to Candace Grove, Russell Moore, Aaron Bartels, and especially Caitlin Vacanti for their dedication, natural archaeological ability, and adept observations throughout the course of the season. One could not ask for a better crew. 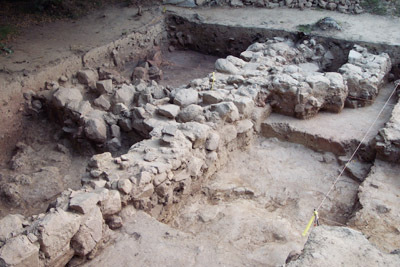 Excavation is virtually complete in this area of the site. Now that the units have been backfilled, we are left to contemplate the material record so that we may plan for next year's endeavor. 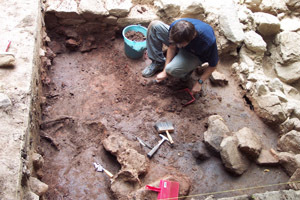 One point is for certain though, Poggio Colla still possesses extraordinary archaeological potential and in years to come shall continue to produce groundbreaking discoveries. 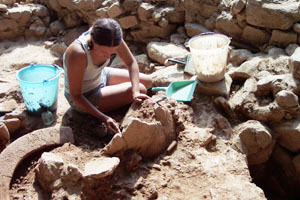 Caitlin Vacanti excavating the pithoi in Trench PC 22. 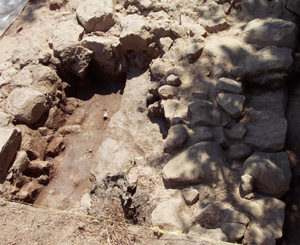 View of Trench PC 22 from the southeast showing pithoi. 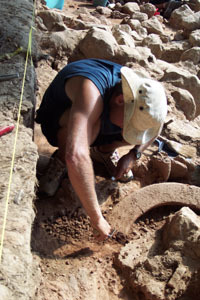 Russell Moore continue excavation of the pithoi. Aaron Bartels taking a pass in Locus 1 of Trench PC 19 near season's end. 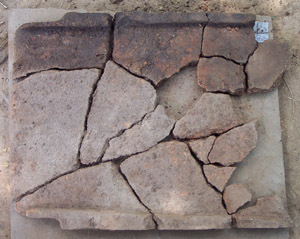 Nearly complete pan tile removed from Trench PC 24 during Week 7. 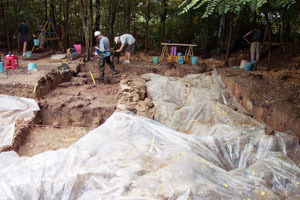 Above and below: Trenches PC 19 (foreground) and 22 from the north at the end of the 2002 season. 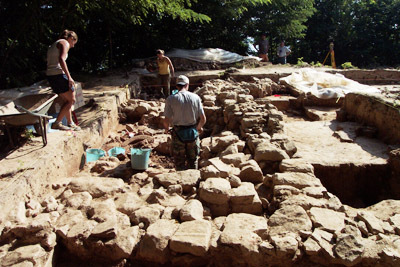 Curved wall and large blocks in Trench PC 19 at the end of the 2002 season. 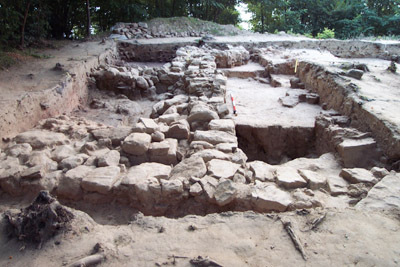 View from the southwest corner of Trenches PC 19 and 22 with PC 23 in background. 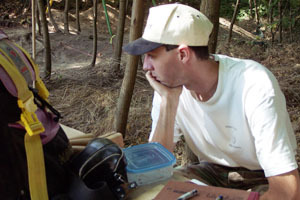 View from the south of Trenches PC 19 and 22 at the end of the 2002 season. 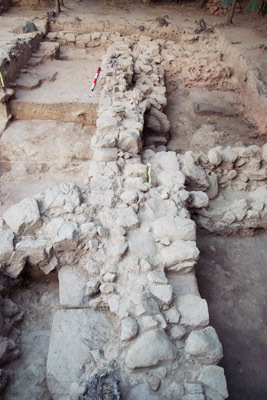 Partial view of Trench PC 22 and all of PC 19 from the southeast at the end of the season. Detail of Trench PC 22 showing scarp, wall, and feature. strata in scarp for final drawings in the field notebook.